During exercise, your body loses vitamins through perspiration and metabolism, especially water-soluble vitamins such as B complex. Fat-soluble vitamins such as A, D, and E do not get lost as easily as water-soluble vitamins because they are stored in your fat tissues. In addition to carbohydrates and proteins, your body needs certain vitamins to help metabolize replenish cellular energy, repair damaged tissues and reduce free radicals. Nearly all B vitamins are involved in the metabolism of carbohydrates, fat and protein. Without adequate amounts of any one of these vitamins, you cannot properly convert these nutrients into energy. B vitamins such as thiamine, niacin, riboflavin, B12 and B6 act as assistants to metabolic enzymes to initiate certain steps in the metabolic process. You can obtain these vitamins from meats, dairy products, fruits, vegetables and legumes. Dietitian Ellen Coleman recommends that you consume a post-workout meal that is rich in B vitamins in liquid form to increase absorption rate. Options include fruit smoothies or protein shakes. Vitamin E is a fat-soluble vitamin that helps reduce free radicals in your body. Free radicals are unstable organic compounds that are byproducts of cellular oxidation. These compounds damage a cell membrane by taking away one of its electrons. Biologist George Mateljan, author of "World's Healthiest Foods," suggests that you eat nuts, seeds and cold-water fish to obtain adequate amounts of vitamin E. Aim for about 1,000 mg a day in your diet. Vitamin C is a water-soluble vitamin that acts as an antioxidant and helps to form collagen, which gives structure to connective tissues in your skin and gums. It also helps regenerate vitamin E after it has donated an electron to a free radical, supports your immune system and improves iron absorption, which helps your body replenish nutrients and repair tissues damages. Mateljan recommends that you obtain vitamin C from citrus fruits and green, leafy vegetables because of their high concentration of this vitamin. Eat the vegetables raw; cooking destroys some of their vitamin C.
Your body uses vitamin D to regulate calcium and phosphorous levels in your bloodstream and absorption in your bones. According to the Linus Pauling Institute of Oregon State University, vitamin D also reduces your risk of prostate, breast and colon cancers, as well as osteoporosis. Strength training without vitamin D would be ineffective. 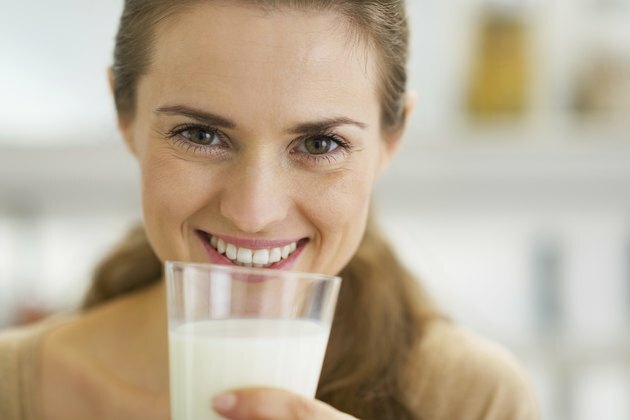 Dairy products such as milk and yogurt are the best sources of vitamin D. Do not take more than 50 mcg of vitamin D per day.